The clickety-clack of the Scenic Railway climbing its wooden, rollercoaster slopes has not been heard in Margate for nearly 10 years - but the 1920s theme park ride is now operating again and generations of fans have been waiting for this moment. What is its enduring appeal? The Scenic Railway is considered to be the heart of Dreamland - an unchanging icon that has stayed the same through decades of change. It fell into disrepair after the attraction closed in 2005 and was badly damaged by an arson attack in 2008. And when a revamped Dreamland opened in June some rides were operational but the Scenic Railway was still undergoing restoration. Visitors left operators in no doubt that it was very much wanted. But what lies behind its attraction? Part of the answer is the significance of the ride through generations of families. Grandmothers phoned the theme park this summer to tell staff they wanted to bring their granddaughters on the ride they themselves had enjoyed as children. And couples who went on first dates on the rollercoaster wanted to relive the moment - but now as parents of four children. 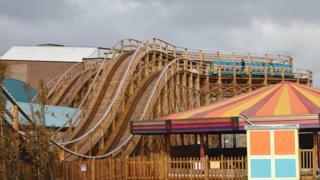 Dreamland's chief executive Eddie Kemsley said the huge amount of feedback on social media revealed "amazing stories". But she believes another key feature of the heritage amusement park and its historic Grade II* listed rollercoaster is its nostalgia. "What we have achieved is quite simple," she said. "It's authentic, with great fish and chips. We've got a few rides, entertainment, Punch and Judy, and it appeals to different generations. "It's not about technology and it's not hugely sophisticated. It's wholesome, British and traditional. It's a fun day out." Dreamland's boss said life now was "so hi-tech", but the theme park was still about people. "Entertainments like Punch and Judy - there's a reason they lasted hundreds of years," she said. "They're fun, they work and they're never going to change. "This takes us back to a simpler time." Work to restore Britain's oldest rollercoaster began in 2014. The wooden structure was completely replaced by a Kent-based firm, and the track and trains came from a company in the north of England that started off building trains for coal mines. The restored Scenic Railway is almost the same as when it was originally designed by Sir John Henry Iles who bought the site in 1919 and set out to create an American-style amusement park. To a lay person it will appear identical, but connoisseurs will see changes and modifications made for operational and safety reasons to make sure the ride is robust. Those who remember the whole structure shaking when the train went over it will be disappointed. There is still the clatter of the wheels of the train carriages, but the wooden rollercoaster stands strong. For anyone used to 21st Century rollercoasters and worried about trying a vintage ride for the first time, safety measures are in place. A panel of experts has made sure it's as safe as possible. Rigorous inspection processes are in place - and because it's made of wood, a carpenter walks the track every day. The theme park is hoping for another boost to visitor numbers now the Scenic Railway is operational. Bed occupancy in Thanet was up by 50% this summer and the nearby Turner Contemporary saw a 25% increase in visitor tickets, Ms Kemsley said. Dreamland is also aware that a third of its visitors have come from London and have chosen Margate over any number of other tourist destinations. Ms Kemsley said Margate had witnessed a resurgence in its seaside attraction status, but Dreamland still needed support. Its 1950s ballroom will open next week, Halloween and Christmas offers have been planned, and work is under way on the Hall by the Sea - a venue to hold 1,600 people. Ms Kemsley put it simply: "We have got more to come."